I’ve done many teddy bear illustrations over the years, but some of them I do forget, but this isn’t one of them. Although I am not a great fan of Hallowe’en, I do love the colour and imagery that I had to capture in this drawing. I was asked by a big company in America, to illustrate one of their many beautiful teddies and after looking through their glossy catalogue several times, I was ‘taken’ to this little witch bear, with her sequinned cape and starry hat. I liked drawing this teddy bear ‘as she was’, which included her rather sad looking face. A number of my customers used to say, “Can you draw that teddy bear smiling?” and I replied, “I draw the bears as they present themselves”. Teddy bears have individual characters: some happy some sad – just like human beings. I remember my youngest niece, Cora, was just a baby when I started this illustration and the small wizard or witch that was coming out of the jack-o-lantern resembled her a little bit (she will be cross with me for putting this on here! ), so I had to include him/her in the illustration. Many of my teddy bear illustrations have a soft pastel theme, but with this one I could use the strong colours of green, orange and purple without hesitation. I loved doing the confectionery: lollipops, cupcakes and biscuits with the ghosts and black cat cake toppings. It was a great deal of fun (I think I ate them ALL afterwards!). I had heard from the children of my friends about this new Disney movie called ‘Finding Dory’. I listened to them and said, “Is it not called ‘Finding Nemo’”? This seemed to silence them momentarily, until one of the children, piped up with ‘No, it isn’t, they’ve already found him!”. That shows you how much I know about movie trends. I hadn’t used Fimo since I was a student (quite a few years ago now), so using this coloured clay-like material was rather like starting anew. I didn’t have a great deal of time to spend on these creations, but tried to do my best in what little time I had. 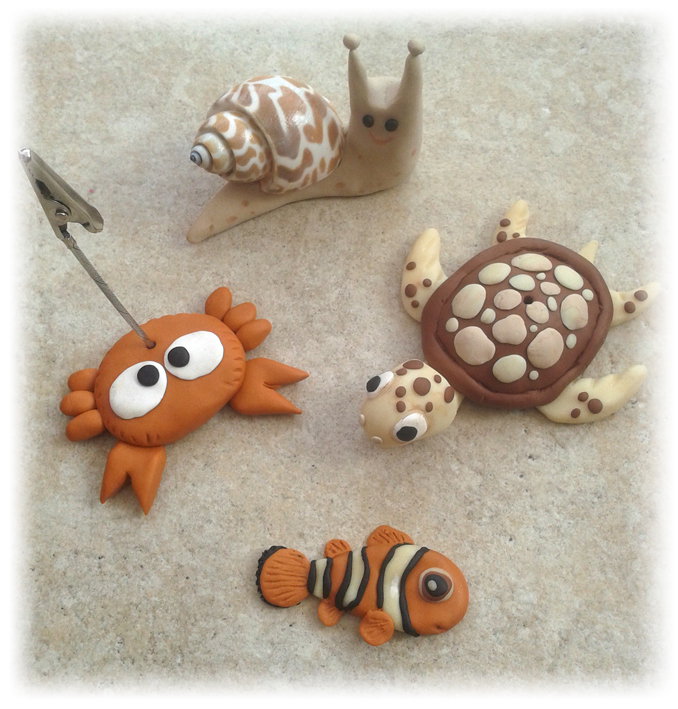 I had very little Fimo too, so the finished objects are rather small and a trifle delicate. I even managed to produce a crab with a picture clip, which wasn’t difficult but was fun to do. 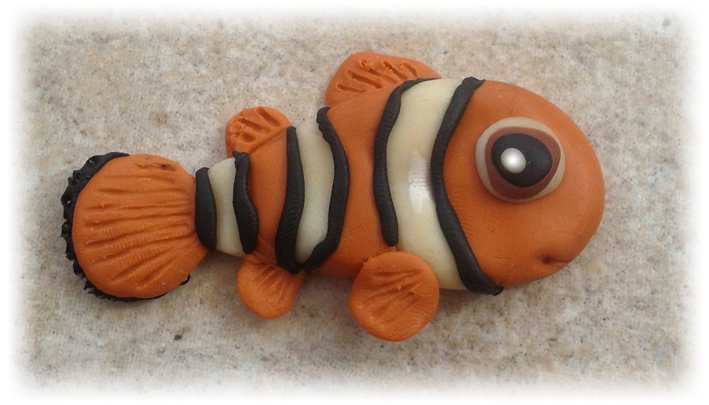 I hope you like my Fimo Nemo (which is a good rhyming name) or clowfish, if you prefer, and the other creations. Hopefully if I have time this month (what with teaching, gardening and general home improvements), I might just see if I can go ‘Finding Dory’ too.